Our youth mission as church and parents is to cause a child to identify as an Orthodox Christian. We know that we must struggle to accomplish this God-given mission. Our society, our schools, our media no longer emphasize God, faith, values and morality. Parents have to constantly confront the teachings of the world. We pray that our children will mature as children of God’s Kingdom and work and succeed in this world as Christians. Parents would be wise to take advantage of the help Sunday School gives in their efforts to create a strong Christian family. Nursery through Twelfth Grades. Nursery is open to all children who have turned three by the start of December. The Eleventh and Twelfth Grades are discussion groups which take place on alternate Sundays of the month, with the Eleventh Grade meeting on the second and fourth Sundays and the Twelfth Grade meeting on the first and third Sundays. On the Sundays these grades don’t have class, students are expected to either serve Altar (for boys in grades 4 – 12), sing in the choir, or assist in Sunday School, as indicated by their choice on the registration form. Children in grades seven through twelve participate in the St. John Chrysostom Oratorical Festival. Curriculum is that of the Archdiocese Department of Religious Education, which is regularly improved. We also use other materials to provide the best program. Registration fee of $30 partially covers books and material. 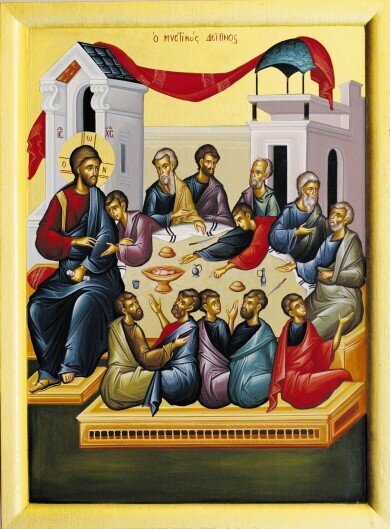 **SCHEDULING: Children arrive at 9:25 am, enter Church, light candles, and venerate the Icons. Children in grades N – 1 are expected to sit with their families, while children in grades 2 – 12 sit in their labeled designated row with their teacher. At Holy Communion, those Sunday School children and staff who have prepared, will get on line first to receive Holy Communion and then proceed to their classrooms for their lesson. Children who have not prepared to receive may proceed to their classrooms at this time. Younger children may be escorted by a family member. After approximately 40 minutes of class time, after coffee hour has started, teachers will dismiss children in grades 2 – 12 into the hall for coffee hour. Parents whose children are in grades N – 1 are asked to go to the hallway outside their children’s rooms to wait for dismissal at that time. Tardiness is not helpful for the student or classmates and teachers. Class is less than an hour and tardiness keeps children from worship and disrupts the lesson. *** Once a month on their “Church Day” boys will not have class, and serve altar during liturgy. There will be a sign sheet at the candle stand for attendance purposes for both boys and girls on their Church Day. Please have your child bring in an item for the food pantry on their Church Day. Our teachers are dedicated volunteers, who give time for a) Sunday mornings, b) week-night meetings and education sessions, c) weekly hours to prepare lessons. Parents should appreciate this and inspire our children to do the same. Meanwhile, parents can support our school by reinforcing lessons at home, reviewing, asking questions, etc. Parental participation is essential. The children will be asked for their Church offering in class. Children should be encouraged from home to make their own offering as a positive Christian practice of sharing our blessings and offering thanksgiving. Parents, please be supportive. ATTENDANCE: The Completion Certificates are presented in May to children who have ten or less absences. Since there are approximately 32 class/church Sundays, a child should attend at least two-thirds of the year. Attendance pins are given to children with three or less unexcused absences. Excused absences are accepted if the parent notifies the teacher that the child was in another church, etc. Makeup attendance is offered on Holy Week. Parents your support is most necessary. If you have any questions please contact Tina Mihaltses at Queendig4@msn.com. September 16 - Sunday School begins. November 18 - Youth Sunday. November 25 - Family Day, Thanksgiving Weekend. December 15 - Stop N’ Go Liturgy, Communion Breakfast. December 16 - Christmas Program, after Liturgy. December 23 - Christmas Program rain date. December 30 - Family Day, Christmas. January 6 - Classes resume. February 3 - Godparents’ Sunday. April 21 - Family Day, Palm Sunday. April 22 – 28 Holy Week. April 28 - Family Day, Easter. May 19 - Closing Day Exercises. Classes take turns preparing the Hall Bulletin Board. April - Kindergarten May - Nursery-PreK.